Diva Milano Woven Wraparound Sling is available in sizes XS (3.7m), S (4.2m), M (4.6m), L (5.2m) and XL (5.7m). 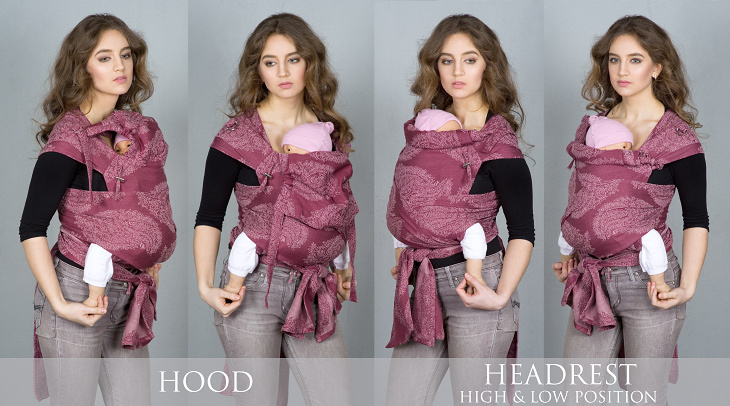 Diva Essenza Woven Wraparound Sling is available in sizes S (4.2m), M (4.6m) and L (5.2m). The right size will depend on your own measurements and how you prefer to carry your baby: size 3.7m is suitable for 'Kangaroo' carry, size 4.2m for the 'Cross Carry' and sizes 4.6m and 5.2m for the 'Wrap Cross Carry'. Diva Milano mei tais are produced from Diva Essenza fabric (regular stock). lower straps are 90cm (35,4") long and 8,5cm (3,3") wide. in 2015 we changed the hood construction, now all mei tais have hoods which can be fixed with 2 half-rings on each shoulder strap. You can use a hood as a headrest with 2 possible positions. When the headrest is fixed in the upper position, it serves as a mei tai back extension so can be recommended especially for toddlers. long straps at the hood to lift easily the headrest when using for back carrying.